What it is: Clipping means cut-up or rescission anything. Clipping Path is cut-up with a fixed path. But it’s usage for graphics design basically because of image editing. According to design clipping path is a vector path. Used for cut out an image with the image editing software. Through this we could edit an image within it also it’s outside concerning change its color. Designers are weird, so it depends on the concerning of designers or editors capabilities and intention. Numerous photographs, websites, design collections, catalogs and brochure items are usage through changes their original background by the clipping path. It continues until to get the existing or admissible background of an image. From background removing and retouching idea, clipping path is the most effective procedure to change an image background with the color contrast. With the help of these, designers get lot of opportunities to show their creativity. Causes there are many plentiful advantages and facilities to reuse an image. Procedure: Process is the same, but having different kinds of software to do clipping path. By using the tool into Adobe Photoshop creating path and edit as successfully as clients want. It’s usage also in 2D and 3D graphics. Through selecting pen tool have to tracing on the image. In instance if I explain regarding clipping path briefly, firstly must have conception about software’s. There are lots of tools. As like The Magic Wand, Polygonal Lasso Tool, Lasso Tool, Magnetic Lasso, Pen Tool etc. Which one select you are confused? No problem, simply select the Pen Tool. Click on image with the tool and trace first on the front then go back and move forward until completion the path by these process. Now times to apply color on it. We are capable to apply different colors. But should be remember don’t do this with the original documents. Just duplicate it through Ctrl+J and work on it. 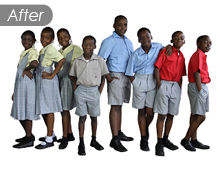 For brief idea visit Our Clipping path Page.